The forth episode of our podcast (Joel's and mine, our combined effort) is now live on iTunes. Yay!! 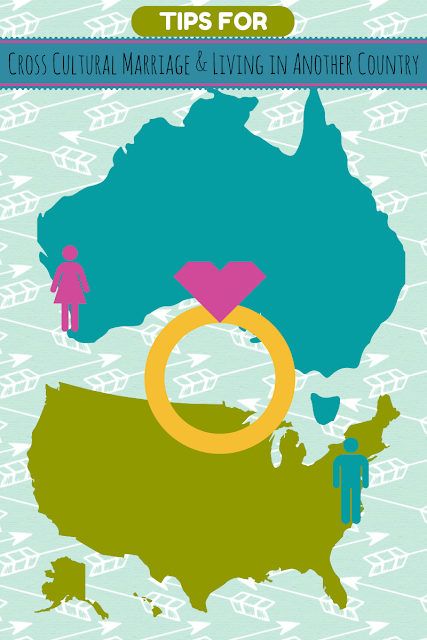 In this instalment we are talking about what it is like to be in a cross-cultural marriage (he's the American, I'm an Aussie) and how no matter where you live, one, or both of you is always living in a different country to their homeland. Joel gives one or maybe more, it is hard to tell, tips on how to deal with living in a country that you didn't grow up in. We share some of our stories of our own experiences and have a good laugh while we are at it. That is what this podcast is all about, just getting together and having a laugh at our expense!! Like I have said before, you don't just have to sit at your computer and listen, the best way, is to get the Podcasts app on your iPhone (or equivalent for other types of phones) and download the episodes so you can listen to them when you are scrubbing the shower, or driving in the car, or going for a walk or while you are enjoying a nice glass of wine when the kids go to bed!! If you SUBSCRIBE on iTunes then it will automatically download the new episodes onto your phone, so you wont miss any! If you don't have iTunes, you can listen here too. And of course if you want to, we would love for you to give us a quick review or rating on iTunes! & Linking with Jess for #IBOT today too! 6 comments on " Podcast Episode 4: Cross Cultural Marriage and Living in Another Country"
A number of friends of mine have partners from different countries and it does make it so hard. In most cases with my friends they opt to live in a country that is home to neither of them, but in the middle of both. I have a cross-cultural relationship too (he's Italian, I'm Australian). It's far from easy and we don't have the same first language either. I think it's fantastic that you guys team up to make podcasts together. Whenever my Other Half and I try doing something together we end up nearly murdering each other! I've never used podcasts before because I'm not very technical now you've got me intrigued! Oh you have a Joel for a husband, me too! I don't know anything about podcasts, best get myself up to tech savvy speed with it all! But I can relate, my father was Portuguese, met my Mum on a P & O fairstar cruise (she was 19 and my Dad was a waiter). After Mum's return to Australia, she discovered she was pregnant with me, so my Grandfather promptly sent my Mum back on the cruise again to meet with Dad and sort this out!! They married in Sydney not long after, with an English translator for my Father, and then moved to Tasmania, where they remained married for 14 years. It was a huge transition for my Father, he had to learn the language, left all his family behind in Portugal and France, and with a young family, he wasn't able to visit them very often at all. He knew nothing of Australia before arriving here to live. I think the hardest choice for him, was after my parents divorced, his children all being in Tasmania, his family all in Europe. In the end he chose to stay in Tasmania, and I think he never regretted the choice he made. Wow! It is a wonderful and informational website about financial markets. It is very useful for us. So, I loved it. Many, many thanks to you for creating such an informative website. If you would like more information about this please visit most active stocks The advantage of these most active stocks is they allow for a vast amount of customization by the user. That same advantage can create a disadvantage for some users. Those users may not really know what they are looking for or what data criteria might produce a most active stocks of stocks that present the highest possible probability of a successful stock trade. Introducing The Yellow Dandy Podcast!